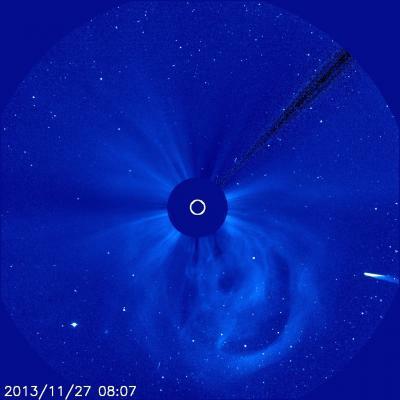 Happy Thanksgiving Comet ISON: Nice Knowing You? C/2012 S1, Comet ISON, is intriguing because it has never approached the sun before and that is scientifically terrific. Comet ISON began in the Oort cloud almost a light year away and has traveled for over a million years. Unlike more famous comets, Halley's as an example, it has never come this way before - and that means it is still made of pristine matter from the earliest days of the solar system's formation. Its top layers haven't been lost by a trip near the sun. To study it as it approached Sol, a vast fleet of solar observation experiments have been watching. Would it break up or slingshot? Observations over the weekend suggested ISON was getting dimmer and might already be in pieces but then yesterday the comet once again brightened. 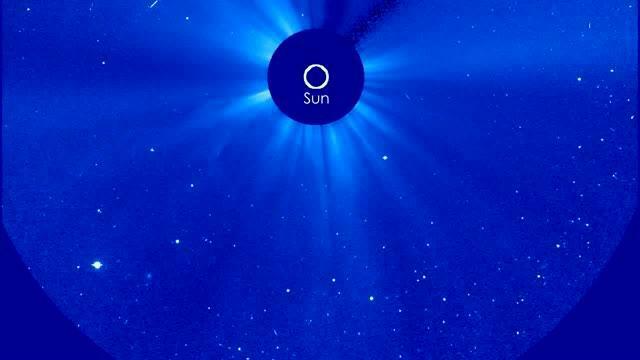 In the early hours of Nov. 27th, the comet appeared in the view of the European Space Agency/NASA mission SOHO - the Solar and Heliospheric Observatory in the Large Angle and Spectrometric Coronagraph instrument. Coronagraphs block out the bright light of the sun in order to better see the dimmer solar atmosphere, the corona. In these images, the comet looks quite bright as it moves in from the lower right of the image. A giant cloud of solar material, called a coronal mass ejection or CME, is also seen in the images bursting off the bottom of the sun and heading out into space. It is as yet unclear if the CME is heading towards ISON but even if it does, it poses no real danger to the comet. If the comet has already broken up, it should disintegrate completely as it makes its slingshot around the sun. This would provide a great opportunity for scientists to see the insides of the comet, and better understand its composition — as such information holds clues about what material was present during the solar system's formation when this comet was born. However, it would likely mean no comet visible in the night sky in December. We'll only know for sure after the comet rounds the sun later today.